Oceanfront yoga was beautiful today. Sylvia, a new teacher, led our small group. She reminded us to bring awareness to our spirit. That was my intention. I was so connected to my breath, so aware of every movement of my body. My mind did not wander like it usually does. I didn't even catch myself thinking ahead to what I wanted to get done today. I just stayed in the moment, in my practice, in the sun- fully open to receiving the gifts of this day. On the bike ride home, I decided to take the long way back around the bay. The usually crowded boardwalk was a clear path in front of my tire. I didn't hurry. I just pedaled rhythmically, noticing the sun on my knees, the sound of the waves, the smell of the jade flowers mixing with the salty air. "Relax, God is in control." Another timely message from a kind Universe. Just this morning, I was lying in bed considering how different my experience at this point on my path would be if I released control, if I slowed down my search for answers and solutions and took time to listen to my heart. I have moments of understanding with this and have written about living this way, but in my day-to-day I find myself reacting with agitation to the feeling of time hurling forward. I find myself gripping, slipping into holding patterns, having unreasonable expectations and self-imposed anxieties. I hold so firmly to what I want to accomplish, ignoring pleas from my soul to slow down, letting ambition cloud my experience. All in an effort to control the outcome. This is not how I want to live! Now or in my future. Perhaps this is why I've been so slow to learn from my "aha" moments. I have yet to fully understand how to gently hold my vision, faithfully nurture my creative dreams and continue boldly on my path- while surrendering control and letting my life unfold the way it is meant to. Somewhere along the way, I got it into my head that I am the maker of my destiny, that I am solely responsible for my happy life, that it's all up to me to create this experience. When did I forget the truth? but I am not THE Maker. and it becomes easy, like Sunday morning. I decided to take a new path through the grass. I tend to take new paths when I'm alone. I'm not a creature of habit when it comes to my wanderings. With each rise and fall of my running shoes. The swish swish swish of the massive sprinklers at the south end of the park. It was a split second decision. I ran a nice distance with cool sprays of water coming at me from every angle. There was much squealing involved. Soon my soul was drenched and blissful. And send energy shooting in every direction. The energy stays with me all day. It is my shadow on the jog home. It is the words spilling out onto the page. It is the orange paint across the canvas. It is the brave ideas that flow like water as I make the bed and feed the dog. It is available to me- to all of us- any time we choose. The call of your inner six-year old's heart. Pray tell, my friend. How do you tap into your energy? I felt a tug today to visit the ocean. I don't surf or do much swimming or sun bathing, but a walk at the edge of the Pacific helps my soul connect with nature in a big way. While there, I spotted these rock cairns. I've been seeing these little intentional rock piles everywhere lately: from motifs in art and pictures in magazines, to actual cairns in nature- around my neighborhood and some wilder areas. Today they really stopped me in my tracks, these five well-balanced pillars. I got the sense that they might represent something special for me, and I liked their silhouettes against the pale gray sky. So I sat with my knees in the sand, bent low to photograph them. 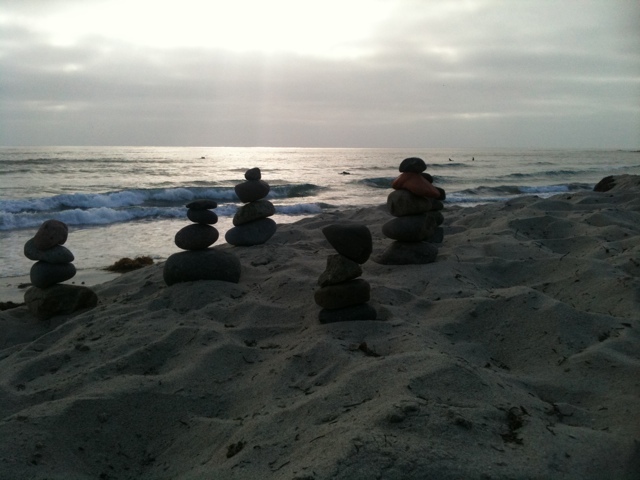 The beach was fairly busy, but I felt a stillness and peace sitting with the cairns. I felt more grounded than I have in days. Hikers often use rock cairns for marking trails or defining paths- that much I knew. Whoever left these cairns on the sandy cliff overlooking the beach may have just been playing with the rocks they found there. Once home, I decided it was time to do a little research on the symbolism of cairns, since the universe has been intent on presenting them to me so consistently this summer. What I found spoke to me- big time! According to Amy Solomonson at Infinity Foundation, for thousands of years, these "spiritual journey markers" have represented the strength, history and endurance that is available to us as we contemplate the next step on our own personal journeys. [They] "symbolize how ultimately the puzzle pieces of our story will balance with faith, patience and time." Ah yeeees! So maybe I'm reading into it, but it feels like a nice foothold of hope for the state I've been in this summer- unsure of my next step in my creative life, feeling a little lost about which direction to go in, and trying through it all to be patient and trust that it will all be revealed to me in due time. I think being open to the messages the universe sends us (both the grand and the subtle) is very much about spotting the signs and perhaps reading into them a bit. When we are open to it, the universe reveals what we've known deep down all along, right when we most need it echoed back to us. 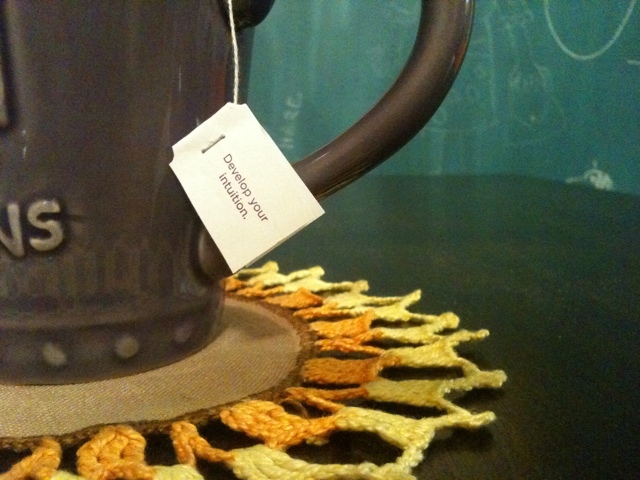 Today that affirming message brought comfort. I am reminded that my creative life is a journey. Journeys do not imply clear destinations. Even from this stuck point, at least I know I'm on my path, and I feel hopeful that the pieces of my story will come together. I've decided that I'll start erecting little rock cairns along the way, to pass on the symbolism for some other traveler in need of a timely message from a kind universe.